This tapestry "Monet's Style" is an impressionistic rendition of Claude Monet's garden at the famous grounds of Giverny. Monet's garden is preserved to this day to reflect the beauty and tranquility as in his day, and the lake and lilypads and pink flowers can be seen here in this impressionistic detail from his lake. The pinks of the blooms are echoed in the peach color of the water in the late afternoon sun. This gives an impression of warmth. 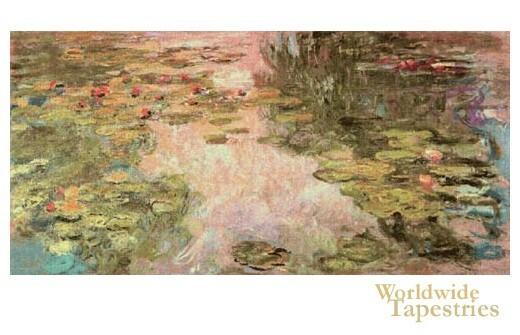 This art tapestry "Monet's Style" is backed with lining and a tunnel for easy hanging. Dimensions: W 82" x H 40"